Jason and Lance Mackey hugging at the finish line. Twenty-two seconds separated two brothers which suffered many highs and lows on this journey across Alaska. A large crowd of fans, including several 2015 Iditarod finishers gathered on Front Street and in the chute waiting to welcome the inspirational Jason and his 4-time Iditarod champion brother, Lance. Jason arrived first and received a warm welcome by fans and friends acknowledging his support of his brother. Jason had a very emotional day out on the trail, crying at many points. The entire way to Nome the brothers were racing, playing a game of leapfrog with each other. This journey was one in which the brothers had several challenges to overcome. “I owe him everything.” This is what Lance told reporters after crossing the Burled Arch. Lance had an extremely emotional race and his brother experienced it all with him. He tried to get Jason to go ahead back in Huslia, but they ended up back together. Jason changed his entire race schedule to “babysit me,” Lance said. Lance also stated he knows he would not have finished the race had it not been for his brother. Jason is a hero in many people’s eyes, especially to his brother Lance. Sacrificing his own race time to stick with his weakened brother. 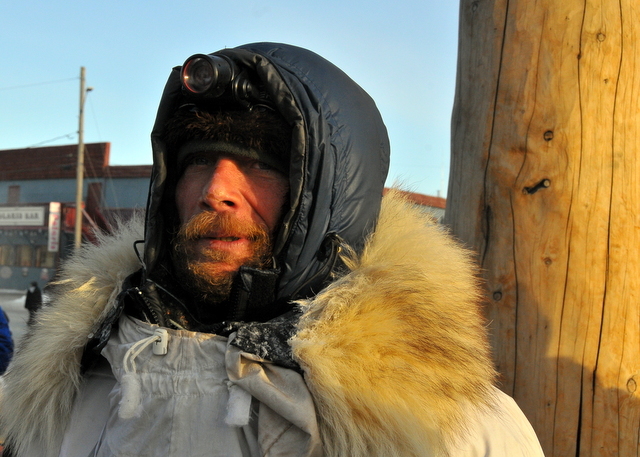 Jason knew this quite possibly could be Lance’s last Iditarod and loyally supported him to Nome. After crossing the Burled Arch within twenty-two seconds, the two embraced. Lance, too, can be considered a hero in many eyes. Lance came upon Scott Jansenn’s dog team near Koyuk, without Scott. Extremely worried about Scott, Lance hooked his team to Scott’s team and mushed them into Koyuk, a genuine act of sportsmanship. 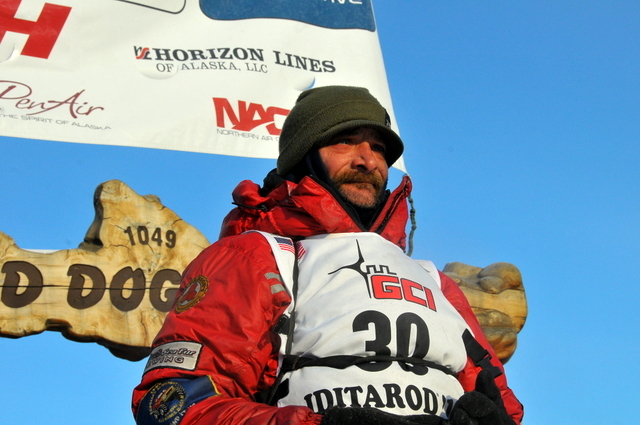 Lance was relieved when he arrived at the checkpoint to see Scott safe. 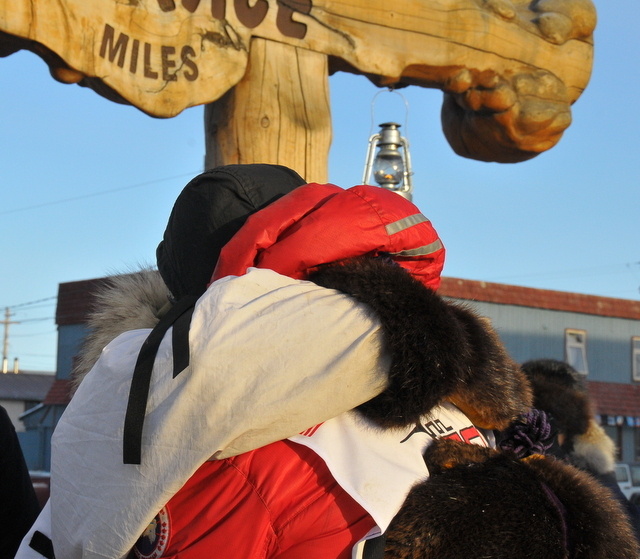 Scott was waiting for Lance when he arrived in Nome, the two shared a hug. This story demonstrates winning or placing high is not always the most important part of competition. People don’t necessarily remember what time everyone finished or what place, but they do remember the special stories along the way. Sharing a bond with a family member on the trail is a memory that will withstand a lifetime. A fellow musher helping out your dogs will never be forgotten. Entering the chute on Front Street filled with friends, family, and several other competitors gives you the feeling of chills that will leave you speechless. I experienced that feeling today as I watched Jason and Lance mush side by side down Front Street.